Enhance two of your outdoor hanging baskets easily by placing them on these Esschert Design Large Aged Brown Cast Iron Hanging Basket Hooks. The wealth of lovely scrolls on these brackets lends a delicate look to them, perfectly contrasting their cast iron construction. Each top arm generously extends outward, with a curl near the end for placing your 23" diameter or smaller hanging adornment. Black accents throughout the dark brown pieces offer a distressed effect, furthering the Victorian motif, and the back plates affix easily to a wall. 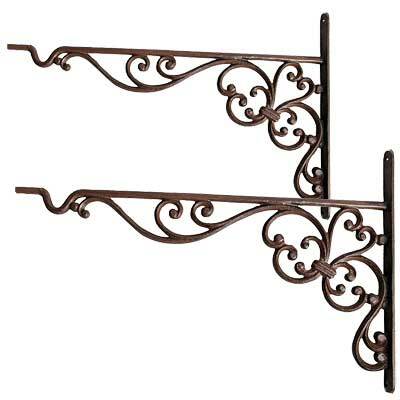 Elegantly display two favorite hanging adornments with these Large Aged Brown Cast Iron Hanging Basket Hooks. Note: This package contains 2 of the Esschert Design Large Cast Iron Hanging Basket Hooks, Aged Brown.